Erysipelas is caused by a virulent strain of streptococci affecting the skin and the tissues immediately beneath it. It is characterized by redness, discoloration, small blisters, and swelling, most commonly attacking the face, and accompanied by high fever and other manifestations of acute illness. The skin shows a glazed appearance, and the affected area has a combined itching and burning sensation and shows a clearly defined margin. The swollen area feels firm and hot to the touch. 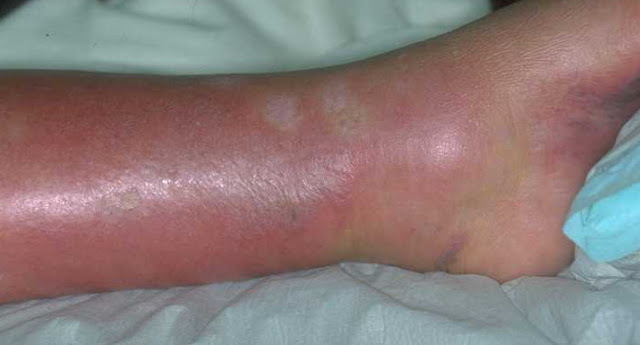 There may be only a small patch of affected skin at first, but it tends to spread in all directions from the original site.The victim of erysipelas feels extremely ill, with marked feeling of lassitude, chills, headache, vomiting, joint and back pains, and a rapidly rising fever, which may go even higher than 104 0 F.
helpful in delaying the multiplication of germs and slowing the progress of the disease until a physician can begin treatment. At present, penicillin and wide-spectrum antibiotics are the most successful known remedies, but there may be other treatments or remedies that the individual physician has found valuable. 2. Give him a liquid diet. See that he takes at least three quarts (liters) of water or other fluids a day. and ten minutes off) until a physician takes charge of the treatment. 4. Cold compresses to the head are useful in relieving the headache, which is frequently distressing. same solution for ten minutes before being laundered.